“All are welcome in this place,” a crowd of people sang in Lafayette Square outside of the White House this afternoon. 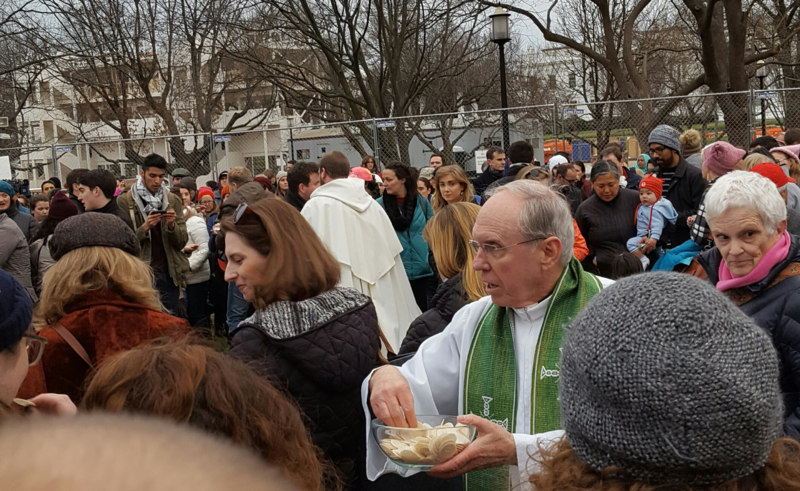 More that 550 people gathered to attend a Mass organized by young Catholics and celebrated by Father Quinn Conners in Washington, D.C., to express their solidarity with refugees and immigrants. The event was a result of grass-roots organization and social media promotion. After President Donald J. Trump signed an executive order banning immigrants from Iran, Iraq, Libya, Somalia, Sudan, Syria and Yemen, Emily Conron and her friend Christopher Hale decided to coordinate a Mass to show a Catholic response to this form of religious discrimination. Mr. Hale called the impressive turnout an “organic movement” comprising “people who were upset by President Trump’s executive order on Friday and felt this is an appropriate way to respond in prayer and action.” Mr. Hale works for Catholics in Alliance for the Common Good, an organization that promotes the social mission of Pope Francis and the Catholic Church in American politics, which sponsored the Mass. “It was a powerful experience, and I hope it buoyed everybody’s spirits because I know it buoyed ours,” said Laura Peralta-Schulte, who attended the Mass with her prayer group. After the Mass, Mr. Hale thanked attendees for coming; saying that while there are 535 members of Congress, over 550 people had come out to pray tonight. In his letter to President Trump last week, Pope Francis wrote, “Under your leadership, may America's stature continue to be measured above all by its concern for the poor, the outcast and those in need who, like Lazarus, stand before our door.” The Mass this evening outside of the White House represented that concern for the marginalized and echoed the pope’s prayer for President Trump. “The Mass as a form of protest is a very beautiful thing" is the logical endgame of Modernist "Catholicism." The Sacred Liturgy has been bequeathed to us by Our Blessed Lord; it is not ours to utilize for our personal agenda. The Church is showing the faultline of schism here in this community-organized "mass." Modernism is contained in immanence, but our Catholic Church breaks through to transcendence. Would love to know where they were when the Catholic Church and religous communities were being persecuted by the Obama administration with its high penalty contraceptive mandate. Persecuted? 80 percent of Catholics support contraception. The Mass was a beautiful thing to witness. Anyone who thinks Trump is pro-life is delusional. He is a fraud. As is his VP who ditched the Catholic faith. The pro-life racket does more harm than good to the cause of protecting the sanctity of life in all its manifestations. The thinly veiled racism of the Obama haters is as un-Catholic as it gets. Any Catholic who voted for Trump is a fool, especially those who use "pro-life" as an excuse. J. Calpezzo: who said anything about President Trump? And why would someone who opposes a person because they are for sticking foreceps in the base of the skull of a baby as it is coming into the world and for sucking their brains out be racist? what does race have to do with being opposed to the inhumanity of abortion and, as Pope Francis (& the teaching of Vatican II) calls it - "an unspeakable crime." In fact, as you may know, African American's are targeted and disproportionately effected by this genocide. SEE blackgenocide dot org or search the topic for yourself. Teresa O'Donnellan is a Joseph A. O'Hare, S.J., Fellow at America.